For wall mounted shelving applications that install on 36" or 48" and use standard Madix 36" or 48" shelves and accessories. Does not have provisions for Back Panels. Installation and mounting hardware not included. Available in heights from 36" to 96". Consult with a contractor for installation. 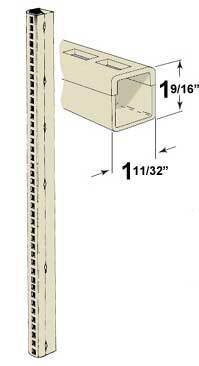 Best used with 48" shelves as the standard wall stud width is every 16"
If you plan to use the half uprights with 3' wide shelves be sure you mount the uprights to a sturdy backing.